by clicking site title "Abiogenesis & Evolution" when visiting item. ...Accurate science with which to refute the inaccurate claims made by creationists...and more. In current biological terminology "abiogenesis" refers to the emergence of life as self-replicating assemblages of chemicals from non-life assemblages of chemicals. This is the hypothesis that primordial life originated within the first 10 million years of Earth's history as a result of chemical reactions that generated larger and larger organic polymers, which ultimately attained the property of chemical self-replication. This modern conceptualization is reasonable in view of what we now know of the demonstrable biochemical basis of all life. The modern conceptualization replaces earlier notions of "spontaneous generation" that viewed life as arising fully formed from non-living matter, or de novo. Such Aristotelian notions of archebiosis probably arose because much of life exists at the microscopic level of prokaryotes and unicellular eukaryotes, and some organisms living on detritus reach visible proportions after having been of microscopic size. The term 'life' in relation to abiogenesis embraces the notion of utilization of energy sources to drive biochemical self-replication. This requires that an assembly of molecules and macromolecules acquired the ability to convert energy into growth and self-replication directed by informational macromolecules. A basic understanding of physical chemistry, biochemistry, biochemical energetics, and informational macromolecules is necessary to apprehend this concept. Is the overall process depicted in the concept of abiogenesis one of pure chance? Of course not, rather the processes would have been governed by the non-random physical laws of chemistry, specifically those physical properties related to organic molecules. Since the processes involved would be widespread across the primordial planet, an enormous numbers of molecules and macromolecules would have been generated in the first 10 million years of Earth history. According to most theorists, conditions on Earth are no longer suitable for abiogenesis to occur. Abiogenesis requires a reducing environment, and oxygenic photosynthesis in Cyanobacteria converted the atmosphere to an oxidizing environment. The exact elucidation/replication of abiogenetic mechanisms would be of enormous interest, yet this has never been a particularly active area of research because it has limited applications. The advent of space exploration has infused life into Astrobiology and the search for the Origin of Life. However, recent work, published in Nature, has demonstrated formation of activated pyrimidine nucleotides in a system consistent with early-Earth geochemical models. 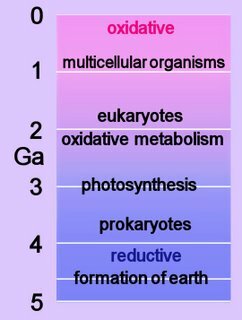 Creationists, deliberately or out of ignorance, confuse the term abiogenesis with the term "evolution", which refers (in this context) to changes in the biology of living organisms over time. Creationists deceptively or mistakenly claim that evolution is not a fact. Biological evolution is a fact. That is, the fossil record and genomes demonstrate accumulated biological change over time. Denial or ignorance of a fact does not eliminate that fact. Evolutionary theory deals with postulated mechanisms that explain the observed biological changes over time. Scientists do not claim that research on mechanisms of abiogenesis or biological evolution provide all the answers that they seek. This is not the problem that creationist love to claim it is, rather it one of the valuable features of scientific thinking. Proof exists only within mathematics, while most scientific reasearch employs empiricism and experimentation in order to disprove inaccurate theories – and thus to eliminate all but the best hypothesis. Basically, scientists seek the best possible explanation for an observed phenomenon, then move on to the next unanswered question. It is expected of scientists that they will abandon outmoded hypotheses. Some creationists claim that evolution of biological forms cannot be explained without first accounting for the origin of life. This, like other creationist claims, is not a valid argument. The processes of abiogenesis and evolution affect two distinct areas of life. An analogy would be the construction of an automobile in a factory (origin) followed, independently of construction, by mechanical wear and tear (evolution). So, the mechanisms of biological evolution can be studied separately from the origin of life. Scientists may study the evolution of biological forms without any reference to the origin of life as assemblages of self-replicating chemicals. Based on radio-dating of meteorites, the solar system is about 4600 Ma – 4600 million years, or 4.6 billion years old (Ga). This occurred 10 Ga after the Big Bang. The sun and planets condensed from a large, hot accretion disk. 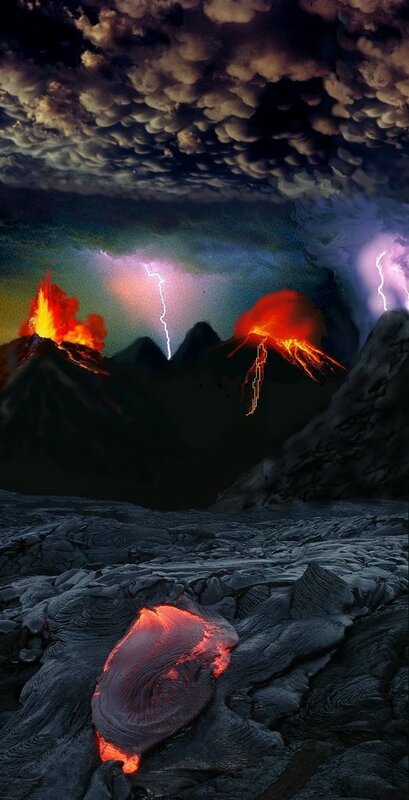 When early Earth was cooling from its molten state, conditions would have been like hell on Earth – hence the term "hadean" for this earliest segment of the precambrian. Meteors rained down on the hot Earth, ultraviolet radiation was unchecked by an ozone belt, and volcanos belched fumes into a reducing atmosphere, which sparked with lightning. Life, of course, had not yet evolved, but it may have had an earlier start than thought previously (see below). The term "hadean" was coined to designate the time before the earliest known rocks. However, rocks have been found that are older than the 4550-3800 Ma time-frame of the Hadean. The last universal common ancestor, or universal cenancestor is hypothesized as being at the ancestral root of all living organisms. Not the earliest or simplest living organism, and not necessarily the sole example of its type, LUCA possessed the genetic material that diverged (about 3.5 Ga) into all currently living organisms. 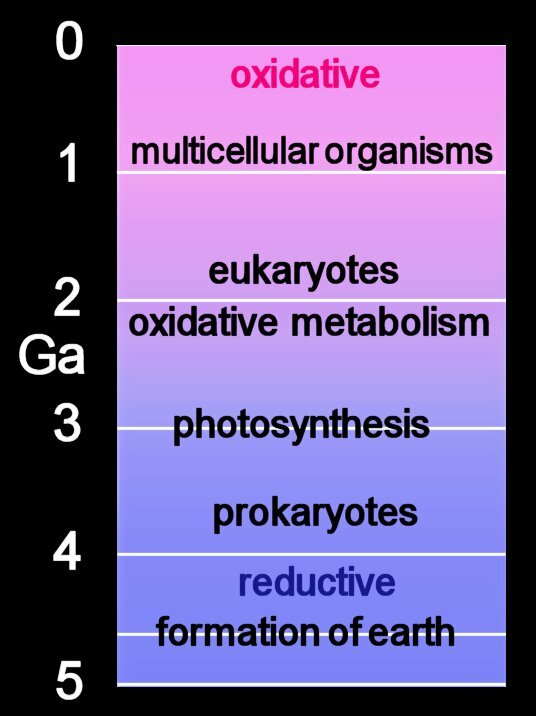 So, the last universal common ancestor sits at the first point of divergence of any cladogram that groups living organisms according to evolutionary-genetic relationships. A number of terms are employed to refer to the universal cenancestor – last universal ancestor (LUA), last common ancestor (LCA), or last universal common ancestor (LUCA). Timeline for life in billions of years (Ga): click to enlarge image. Based on radio-dating of meteorites, the solar system is about 4600 Ma – 4600 million years, or 4.6 billion years old (Ga). The formation of the earth occurred 10 Ga after the Big Bang. The sun and planets condensed from a large, hot accretion disk. Oxygen levels began to rise after the evolution of oxygenic photosynthesis by the Cyanobacteria, which evolved at least at least 3450 million years ago (3.45 Ga) and formed the earliest microfossils as stromatolite reefs. There is considerable evidence that the earliest eukaryotes evolved through serial endosymbiosis. Chloroplasts resulted from endosymbiotic transfers of Cyanobacteria, and mitochondria originated from endosymbiotic transfers of alpha-proteobacteria (purple bacteria). 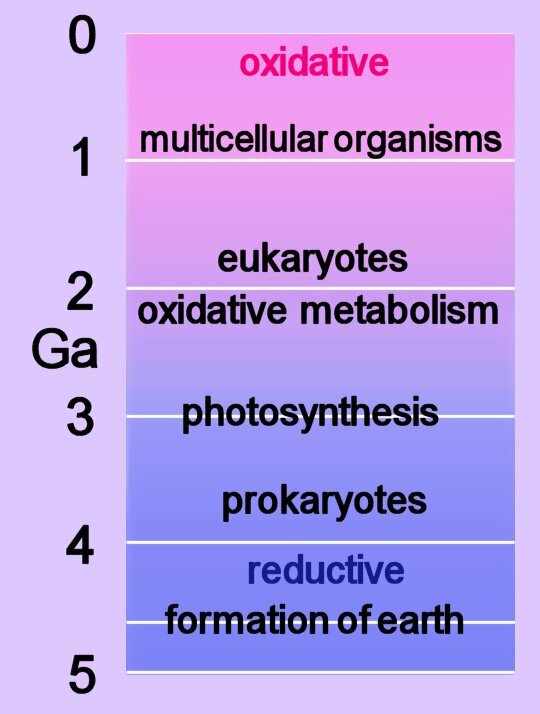 Mitochondria are the site of oxidative phosporylation in eukaryotes. The Woodstock of Evolution -- The World Summit on Evolution (ScientificAmerican.com): Asked about primordial conditions, participant UCLA paleobiologist William Schopf answered: 'We know the overall sequence of life's origin, from CHONSP (carbon, hydrogen, oxygen, nitrogen, sulfur, phosphorus), to monomers, to polymers, to cells; we know that the origin of life was early, microbial, and unicellular; and we know that an RNA world preceded today's DNA-protein world. " In 1953, graduate student Miller set up an experiment in which he passed an electrical current (to simulate lightning discharges in the primordial atmosphere) through the gases then believed to constitute the primordial atmosphere – methane (CH4), ammonia (NH3), hydrogen (H2), and water (H2O). After a WEEK, Miller assayed the resulting chemicals and found that up to 15% of the carbon had been converted to organic compounds. Two percent of the carbon had formed amino acids, including 13 of the 21 that comprise the proteins of living cells. The smallest amino acid, glycine, was the most abundant. It turns out that Miller’s and Urey’s guess about the composition of the primordial atmosphere was wrong, yet the Miller-Urey products and many more products (including nucleotides) have repeatedly been generated in similar experiments that more accurately replicate the early atmosphere. The salient point is that in a very short time, a variety of life-related chemicals will generate themselves from simple molecules provided that some energy is supplied to the system. 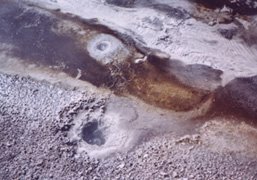 Considering the billions of years before recognizable life appeared on the entire planet, it is clear that chemical evolution could yield cellular life. In fact, the earliest discovered microfossils date from about 3 ½ billion years ago, and this is a minimum 1 billion years since the origin of the planet. Similar processes to those above must be occurring in the energy-riddled immensity of space, because many organic compounds have been identified spectroscopically in space and have been found in meteorites. Kasting, J. E. Origins of Life 14, 75−82 (1984). 3.Space--for example, the 4.6 billion-year-old Murchison meteorite, discovered in Australia in 1969 was loaded with amino acids, aliphatic and aromatic hydrocarbons, hydroxy acids, purines, pyrimidines, and other chemical building blocks of life. 'The evidence strongly suggests that prior to the origin of life the primitive Earth already had many different catalytic agents, polymers with sequences of nucleotides, and membrane-forming compounds,' Lazcano concluded. This prebiotic soup led to a catalytic and replicative RNA world, which led to the DNA world of today." At some stage in the origin of life, an informational polymer must have arisen by purely chemical means. According to one version of the 'RNA world' hypothesis this polymer was RNA, but attempts to provide experimental support for this have failed. In particular, although there has been some success demonstrating that 'activated' ribonucleotides can polymerize to form RNA, it is far from obvious how such ribonucleotides could have formed from their constituent parts (ribose and nucleobases). Ribose is difficult to form selectively, and the addition of nucleobases to ribose is inefficient in the case of purines and does not occur at all in the case of the canonical pyrimidines. Here we show that activated pyrimidine ribonucleotides can be formed in a short sequence that bypasses free ribose and the nucleobases, and instead proceeds through arabinose amino-oxazoline and anhydronucleoside intermediates. The starting materials for the synthesis-cyanamide, cyanoacetylene, glycolaldehyde, glyceraldehyde and inorganic phosphate-are plausible prebiotic feedstock molecules, and the conditions of the synthesis are consistent with potential early-Earth geochemical models. Although inorganic phosphate is only incorporated into the nucleotides at a late stage of the sequence, its presence from the start is essential as it controls three reactions in the earlier stages by acting as a general acid/base catalyst, a nucleophilic catalyst, a pH buffer and a chemical buffer. For prebiotic reaction sequences, our results highlight the importance of working with mixed chemical systems in which reactants for a particular reaction step can also control other steps. Origins of life: Systems chemistry on early Earth.